To start I cut an A2 card from white cardstock, then set aside. Next I ink blended the background using oxide inks in Tattered Rose & Worn Lipstick, and Delicata ink in Golden Glitz. This adds a really gorgeous gold shimmer to it! Then I spritzed it down with white shimmer spray, then flicked gold plaint splatters to it. Next I stamped the wreath layers to white cardstock in Delicata Golden Glitz ink using my MISTI. Then I flicked the cardstock block with gold paint splatters, and proceeded to diecut the wreath layers with their coordinating die. Then I stamped & heat embossed the main part of the sentiment in white directly to the ink blended background. Then I stamped the tiny sentiment to white cardstock, trimmed it into a thin strip & added a banner edge to the left side. Then it was time to put the card together. I layered the ink blended background to the card front with foam adhesive. Then I arranged the wreath & its layers around the heat embossed sentiment, popping them up on foam dots. To finish the sentiment, I tucked the thin strip underneath the right wreath layer. Next I tied a double bow from ivory twine, and adhered it to the where the wreath layers intersect. And finally, I added my signature jewels tucked here & there to complete it! 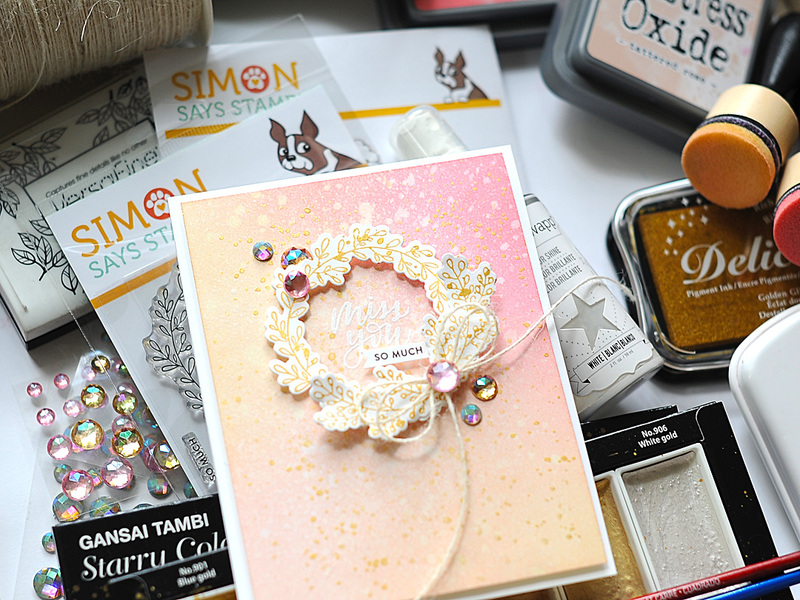 Here is a peek at the items I used to create this card, minus basics like cardstock & tools. This card is a little heavier in product than normal, but that is mostly because I used so many inks! I absolutely purchase new items each month to freshen my products, but I do stick to a pretty strict budget. I like to invest in items that I will get a lot of use out of, and make sure that I am using like items already owned before I purchase anything similar. Finally, if you'd like to see even MORE inspiration from this release, check out the Sending Sunshine 2018 Collection Gallery. And be sure to link up YOUR creations when you get these amazing new products in hand! Before you move on to Olga's blog, I wanted to invite you to follow me on social media. I hang out on Instagram a lot, and share my work in progress in my stories...along with REALLY cute photos of my dogs! :) Plus, I just started a YouTube channel, and while there are only a few videos right now...I will be adding new content consistently! wow!!! absolutely stunning card! those colors are so beautiful! Love your beautiful background with that gorgeous popped up wreath! So elegant! Thanks for sharing your creation and for a chance to win a prize! Beautiful card. I love the soft colors. Thanks for sharing. Gorgeous design. The wreath stamp set is awsome. I like that it's very versatile. Gorgeous! I love the shimmer and shine and the texture the spattering gives. Gorgeous card and I love the sparkle and shimmer first I wasn’t fond of those wreath stamps and dies but the more cards I see with them the more I like them. They are very versatile. Thanks for the inspiration and the chance to win. I love wreaths, too, but they seem dull when I make them. Your stunning card has given me some wondetful ideas, so thank you for sharing! This is absolutely lovely Lea. The background colours are gorgeous and really showcase the focal images of the beautiful die cuts. Well done! Beautiful background and I really enjoyed watching you make it with the subtle colors (fabulous choices), the smoothness and gentleness of them -- just wonderful. Love these stamps, they were what I was drawn to most about this release. I was with you (despite being barely able to hear/understand your voiceover) until you got to the jewels. No. Too big, not consistent with the soft and subtle design and colors. Take them off then: PERFECT. Nice job, despite. 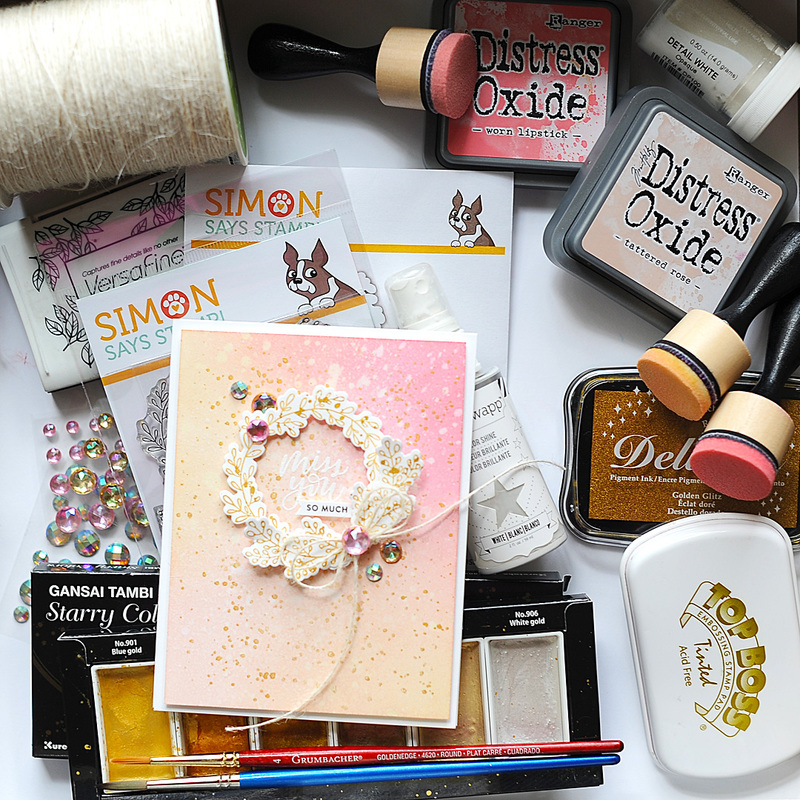 I think this serves as a good reminder that there is a person with feelings behind every single card that is shared in this papercrafting world, and we should be spreading kindness into a world that, well...isn't very kind most of the time. That's stunning. I love the soft colors. Wow! Awesome card!!! Colors are beautiful!!! Such a pretty, feminine card! Such a beautiful card. Love this rose gold touch, and you always have just the perfect accent touches. Love the card...all of it! LOVELY WORK, Lea! I LOOOVE the gold splatters! 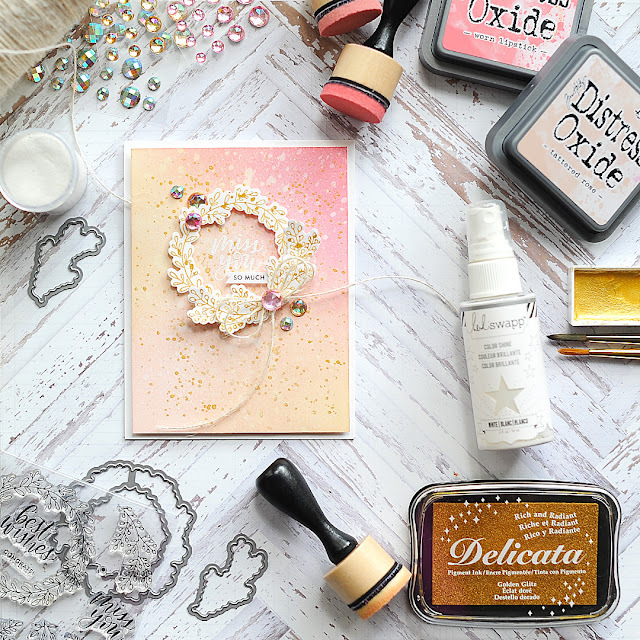 It adds a classic touch to your card, & I also LOVE those Oxide Inks! LOL They're THE BEST! ;) SUPER JOB, Lea!!! ;) THANK YOU for sharing with us!!! Gorgeous card! I love everything about it. Thanks for sharing your beautiful creation! Loving all the pops of sparkle and shine on this card. Beautiful card! I'm going to have to try the ink blending with the delicata gold. So pretty. Live your colors! this is a somewhat delicate and really pretty card-love the touches of glimmer and shine! I'm totally in love with this card & I'm not big into wreaths. The colors you use are wonderful. I will have to try this combo out! And no matter what anyone says, the jewels are perfect! (just because its not in someone's taste, doesn't make the card any less "perfect"-if you can't say something nice, don't say anything at all). I can't wait to see your next card & video ! Very pretty card. Love the sparkle! Wow! This is gorgeous! I love the shimmer! Wow, beautiful card. Never thought of using Delicata to add some glitz. Thanks for sharing. WOW! Such a soft, feminine & ethereal card! Wonderful! Thank you also for the video. After seeing so many of your cards with worn lipstick and tattered rose, these colours will be on my next order. I just every card you make with them, and the gold splatter. SO SO pretty. This card with the wreath is stunning!! I don't know how you have time to photograph weddings and have so many card creations for your blog, but it is so nice that you do. I get so much inspiration. Thanks Lea! Love the jewels! they really take it up a notch! beautiful card! Very beautiful card. Love the soft colors. So sweet. I like the gold splatters and the gems. Such a soft, pretty card! Nice work. Very pretty cards! You are so talented! Beautiful card! :) Love the soft look. Such a beautiful card! The background you created is stunning! I love how soft and beautiful your card is, fantastic! I love this card. It is very elegant. 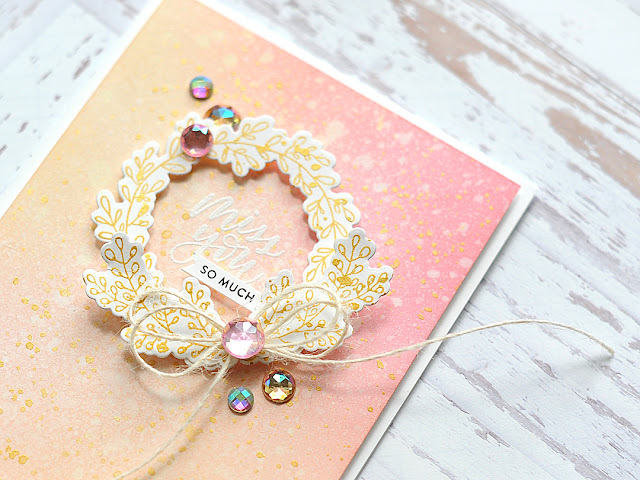 Oh how sweet and feminine your wreath card is!! I understand why pink and gold are a couple of your signature colors....SO beautiful together. This card is gorgeous and I love that you kept the wreath simple so the background can really shine! 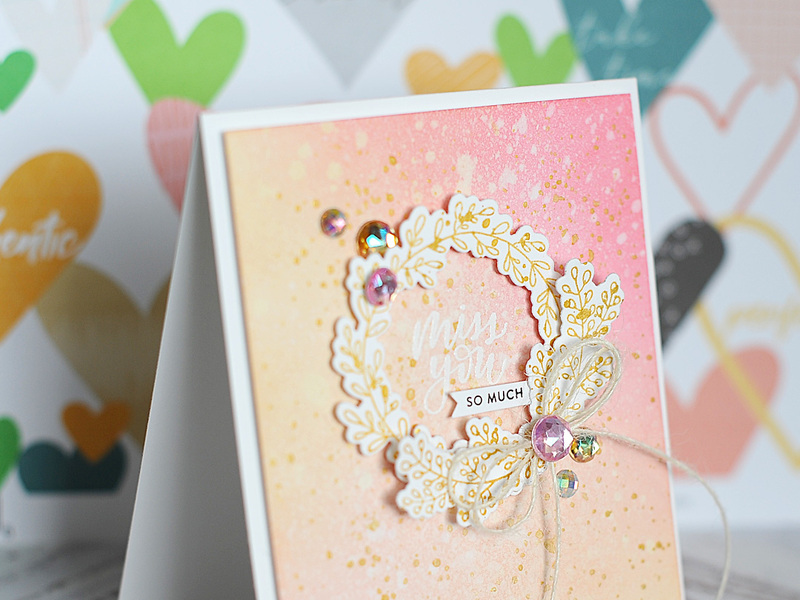 Love the pretty soft background colors, and the shimmer is perfect! So pretty! Loved your color choice. Undoubtedly a very sunny card. Love the rainbow gems! I LOVE this gorgeous color palette! The way they all softly blend together with the gold wreath look so pretty! Swoon!! This is soooooo beautiful!! Thanks for the inspiration. I've added it to my To CASE list. That wreath is really lovely, and I like the background you created as well! love your sweet card !! Gorgeous card, I love the pink and gold. With that combo, so little is needed on the card to make it beautiful. Beautiful color choices-the addition of the gold is amazing. I love your signature colors, your card is beautiful. I didn't't see a listing for the jewels you used on the card. Wow! 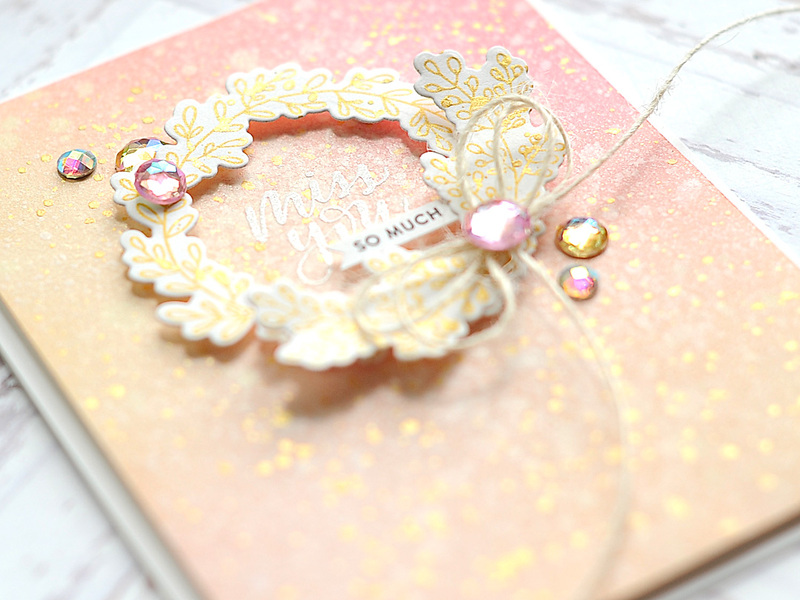 Love all of that gorgeous pink and gold on your card! The wreath looks so delicate and ethereal stamped in gold. You have created a stunning card! The background is wonderful & so is the wreath that adds dimension. Your card is beautiful and reminds me of a fancy Christmas card! I love it! Thanks!! Lovely. Your soft colors are so feminine and pretty! Beautiful, elegant card. I love the soft colors. Beautiful card, love the soft look. Thanks for all your tips, too. What a gorgeous card! I love the sparkle and sequins! What a gorgeous card! Love the soft colors and all the gold shimmer, and the jewels dress it up so nicely! Such a pretty card. Love the gold speckles. It really makes the card shine. Thank you for sharing your talent!!! I love everything about the card you made and I know you will have one happy family member when they open the envelope! Your card is stunning ! I love the gold shimmer with the pink. Really pretty card. Thank you! 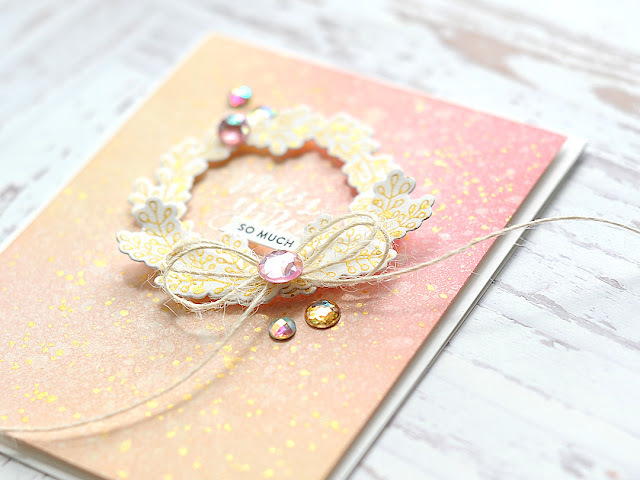 Gorgeous card, I adore the soft colors with gold and the wreath is beautiful. what a gorgeous card. Lovely card, Lea! The pink and gold are great! Stunning. Beautiful colour choice. Wow! The wreath set is now on my list for my next order. Great job! That card is so delicate and heart-warming. That is just so pretty - gorgeous colours! Wow - this card took my breath away! The pink - not usually a colour I like - is stunning - love the ombre. 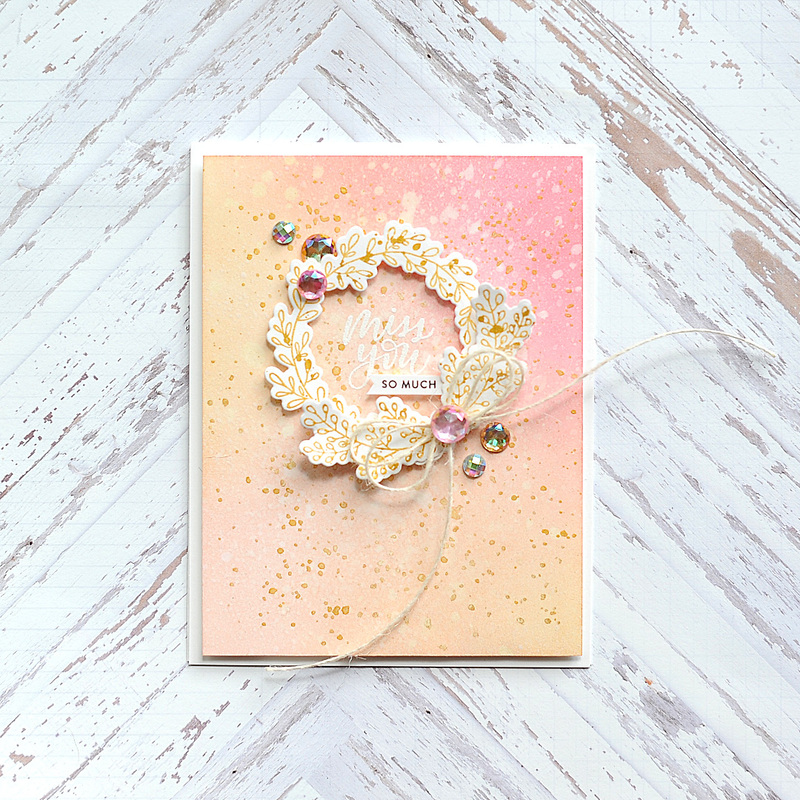 The gold sparkle is just lovely - this is a beautifully feminine and fresh card! Love your background and how you created your wreath. What a beautiful card! Love that wreath! I read every bit of your post because I want to CASE it! I love it! That golden ink is absolutely fabulous! Great color choices. Thank you for sharing. Stunning card! Gorgeous colors and shine, wonderfully elegant. Your card is so pretty! I never thought to try that color combination before but definitely will now. Oooooh, love the gold sparkle look here on your card.this is very pretty. Wow this is such a beautiful card! So shimmery and I love the colors you used. Thank you so much for sharing! Thank you so much Lea. Love your colour choices and your card is stunning. I enjoyed watching you create this, so thanks for showing us your techniques. Beautiful card! I'm a huge fan of rose gold, so I love your color combination. 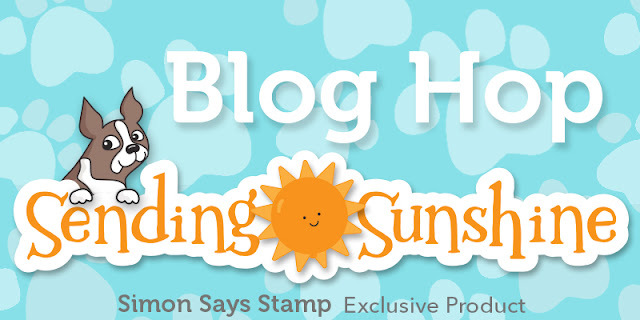 The wreath stamp is so pretty, and I like that you can add to it with the extra sprigs. 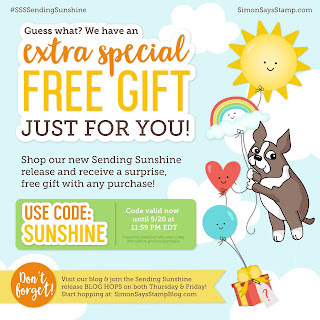 Love, love the Sending Sunshine release. My dog is named Sunshine, this is so fitting. ..defo on my wish list! Beautiful! This may be one of my favorite cards ever seen. It is gorgeous! I love the wreath you created, and the background is so pretty to look at! LOVE LOVE! The gold watercolor really ties the card together. Love the card & color combo! Your card is gorgeous. Love the soft colors and the shimmer. The wreath seems very versatile. Lea, i'm loving your design and pastel choice. I'm trying to win for a silent auction basket . PuppyUpMadison.org fundraising for canine cancer & comparable studies with humane cancer research. https://puppyupwalk.org/madison/support/#foldedhugs I'm loving all the shares! That's a gorgeous, feminine and very elegant card, I really love it! Those gems you used are fantastic! I love the look of the background. I tried to figure out what you did, but enjoyed finding out by reading your process. so subtle and so pretty! Soft, lovely colors, and an elegant card! Love the card! It reminds me of a vintage card with such soft colors! Thanks for sharing! Beautiful card, I love the pink and gold combo so pretty. I love how delicate and pretty this card is. Thank you for sharing! Love the soft colors in the background. Such a sweet card. Love the wreath in gold. 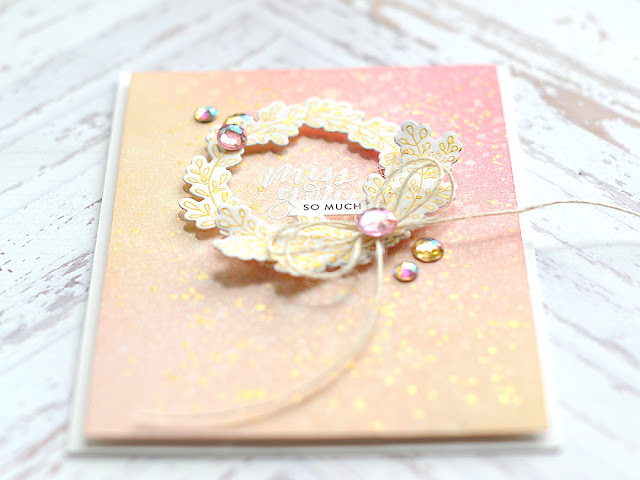 Your card is gorgeous, I love the soft pink tones and the golden splatters, the delicate bow and, yes, the jewels :) . And thank you so much for sharing your video despite your recording problems. We are all learning along the way and we try our best. Gorgeous! I adore your card! So pretty. A marvelous clean and simple card made with Distress Oxide Inks. Wow! Lea, thank you so very much for sharing this gorgeous card!! You have now inspired me to use both my Heidi Swapp white spray and my TH Distress Oxides which bought but have not yet used..... :) TFS!! Pretty background colors and details; and I like how you layered parts of the wreath. Gave it even more interest. Lea, your wreath card is absolutely stunning!! The soft colors are so pretty and I love how you layered the wreath. The added dimension is just so lovely!! Your card is so gorgeous! Love the gold paint splatters! I love this card! The colors are gorgeous. The paint splatters add a glitzy touch. Thanks for sharing. Thanks for sharing your card....it is beautiful and I love the colors! Such beautiful card. You are always an inspiration. That Distress Ink background with shimmer spray is wow! Very pretty , delicate card - thank you for sharing. At first glance this is a super simple card, but with careful study you can see just how much is going on with this very lovely card. I love the soft colors! Gorgeous card with beautiful colors and dimension! Beautiful card! Love the soft colors and gold accents. Looks so delicate. I really like this stamp/die set you chose. The wreaths in the set are so pretty and can be used in so many ways. I like the colors you chose and how you added dimension and "bling" to make the card extra special. Gorgeous card - wonderful items in this new release ! Thanks for sharing ! This is just so pretty! Love the splatter and the gold, absolutely gorgeous! Beautiful card. Love, love, love the background you created. The colors and ink splatters are all perfect! Also love the gorgeous jewels; definitely on my wish list. This wreath stamp set is one of my favorites from the release too; so many possibilities with both wreath and bough stamps. TFS your talent and inspiring project. 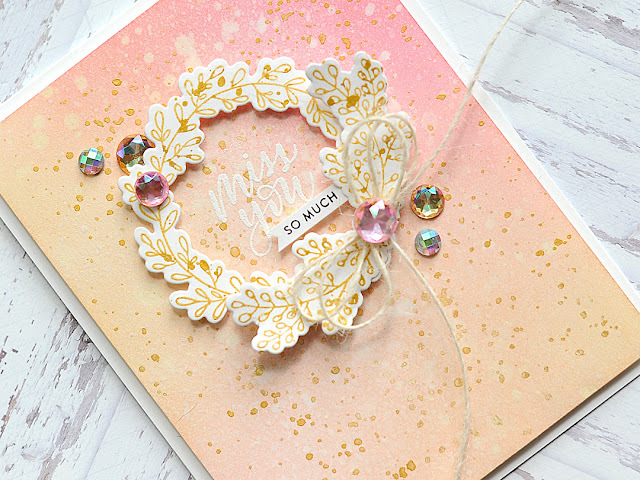 I love the shimmer and shine on your beautiful card. Oh my !! This is such a gorgeous and so delicate card !! So pretty! Love the gold. Love the ombre card panel with the gold accents!